I have tried to write this email so many times before but every time I sit down I am at a loss for words. Thank you doesn't seem to be strong enough to show you our appreciation for all the ways you have helped our family. 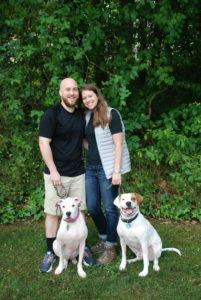 Before we found U.S. Canine, we felt trapped: we wanted to be good responsible dog owners, but over time had become incapable of handling our two fur kids, Summer and Mason. Their aggression toward other dogs and humans had increased to what we felt like was a dangerous level. We stopped taking them places, refused to have people at our house, and basically had no idea how to break the cycle. We lived in fear that every time we went for a walk would be the time that we lost control. We lovingly referred to our fur kids as our "walking law suits." We read books, researched, and contacted multiple dog training facilities all of which ended up in dead ends. We felt like no one could help us and the harder we tried to "fix/identify" the problems the more lost we felt. Then one day on a last ditch Google search, we found U.S. Canine. I can't tell you how happy it makes me to pull up in the driveway and see Mason out with the pack—a happy and balanced dog. His training has changed our household! We have positive boundaries and a sense of calmness throughout the house now that we are in control. Seeing him interact with other dogs is something we had given up on. The training course was worth every dollar and then some. Knowing that we can leave him and when we pick him up he will be calm, exhausted, and balanced is priceless. Taking on the challenge of Mason, is one thing, but what truly sets you guys apart is how you have taken Summer into the family as well. When she was diagnosed with lymphoma, we feared that the stress of training was going to be too much for her system, but knew that with her behavior issues still needed to be addressed. Angie gave us her honest opinion and agreed that the training would be too stressful for her. Most people are only concerned with money, but we felt that Angie and everyone at U.S. Canine are truly are invested in the well-being of the dog and not the cost. She agreed to board Summer and work with her intermittently while she was there. During all of Summer's trips to "camp" she comes home more balanced and happier than when we left her. We loved seeing her with Erica who took the time to push past her "bullyish" tendencies and truly care for Summer. Her anxiety of people and dogs has improved greatly and we now know that we can control her anxieties while balancing her health issues. Overall, we have had such an incredibly positive experience with U.S. Canine and have grown to think of all the staff like family. Every time I call, Lindsay, who keeps the front running like a well-oiled machine, greets me. Then when we arrive, we always look forward to giving the dogs to Tara, who never seems to be worried or anxious; the dogs follow her and never show any anxiety or fear. We love seeing the staff out working with the pack and are still in awe of the calmness of the pack—where else could you pull up to a facility with 30 dogs behind a fence without any barking or chaos? We have been so pleased with the training we have received from Josh and we know that within 5 minutes of seeing us with the dogs, he will be able to identify the issues and show us how to correct it. Knowing that if we ever have any issues we can call and speak directly to Josh or Angie is amazing. We have a place where we can leave our fur kids and know that they are in the best hands possible. As I said before, thank you doesn't seem to get the point across well enough. So, please know that we have the highest admiration for everyone on staff and we truly appreciate everything you do to change the current canine culture, one human at a time.